Tuscany is a dream destination for tourists who want to connect with nature, enjoy a lazy day with breath-taking views, or explore the rich historical past and thriving culture. With Italian food topping the world’s favourite cuisine list, a visit to Tuscany won’t disappoint the food enthusiast in you. Unlike cheesy pizzas and pastas found outside the country, locals use basic, fresh and everyday ingredients to create simple, filling, healthy, and yet flavoursome dishes. Food in Italy has distinct regional ingredients and influences, despite retaining common food elements. Pasta, bread, cheese, olives and olive oil, fresh vegetables, legumes, fruits, sea food and meat form the base. Fresh, local produce and limited ingredients characterise typical Tuscan cooking. This central regional cuisine is based on the “no food wastage” concept. Antipasto revolves around a variety of unsalted breads, soups, cured meats and sausages. Steaks, wild game and seafood feature in the second course with fresh salads, sautéed or grilled vegetables, and bean or chicken stews for company. Tuscany doesn’t have a dessert culture, unless you’re talking about Prato’s biscotti or its gift to the world – Gelato. Enjoy this virtual guide of Tuscany’s top 12 delectable foods, even as you dream of a trip to this enchanting place. In any town in Tuscany, you begin the meal with antipasto which includes affettati misti (cured meat) and varied breads. Crostini di fegato is a popular dish where earthy-flavoured chicken liver pate is spread on thinly sliced and toasted bread. 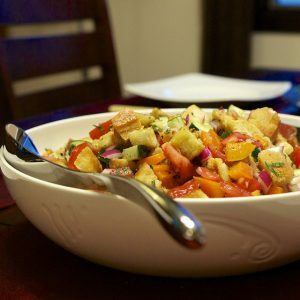 You’ll also find bruschetta or crouton versions with chicken, smoked ham, veal, duck or goose meat, and other topping like onions, capers, anchovies, tomatoes, porcini mushrooms or mozzarella. Unlike breads found in other parts of Italy, in this region, they are made without adding salt. This tradition is said to date back to the middle ages when Florence, the capital of Tuscany, faced a salt shortage. The other legend is that salt was severely taxed across Tuscany, forcing common folk to innovate their bread-making technique. Fettunta is a delicious dish that consists of grilled, unsalted bread served with garlic olive oil and sprinkling of salt. In Tuscany, love for bread is matched by an appetite for soups. In keeping with their no waste motto, dry bread is added to some soups creating versatile dishes. Cannellini beans, tomatoes, kale, celery, carrots, onions, other veggies, black cabbage and stale bread are boiled together in ribollita. Pappa al pomodoro is made with day-old bread, tomatoes, garlic, basil and olive oil. Cannellini beans are the major ingredient in soups like zuppa di fagioli. Acquacotta is a simple vegetable soup with poached eggs and pecorino topping. Pastas are mainstay in Tuscan cuisine along with meat. 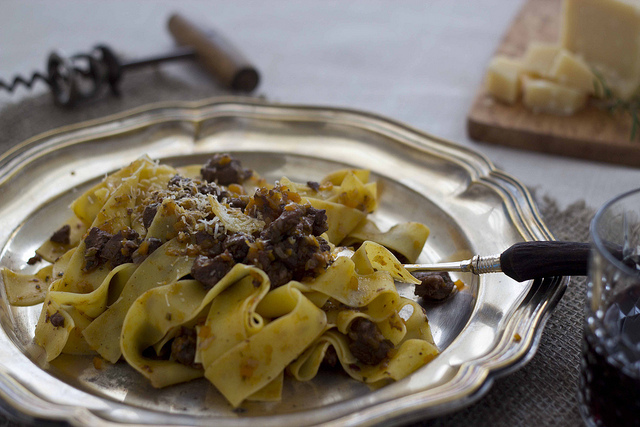 Pappardelle is an egg noodle wide pasta, that served in wild boar, hare or goose meat sauce. The pasta dish may also contain artichokes, sausages and porcini mushrooms. For truffle lovers, there is the famous Tagliatelle al tartufo. This dish consists of pasta with other veggies or meat, and drenched in black or white truffle sauce. Potato tortelli is a stuffed pasta from Mugello served with game meat or ragout sauce. Tripe is another regional speciality, especially in Florence. Lampredotto is popular street food made with the cow’s stomach. Thinly sliced tripe is cooked in broth and served on a sandwich with either green sauce (usually parsley) or red sauce (peppers and chillies). Try bagnato – wet bread version with tomato-tripe gravy. Panini di lampredotto is another dish with hot tripe spread over round rolls or wholegrain bread and topped with salsa verde. This sweetish crepe dish is made with chestnut flour. Water and flour are the only two ingredients used. The batter is spooned on a frying pan and pressed by a ladle to spread it. It can be eaten plain or served with fresh ricotta cheese from sheep’s milk. Other toppings include prosciutto, chocolate and chestnut honey. For a cake variation, try Castagnaccio made with sultanas, pine nuts, olive oil and topped with rosemary. Image credit: Richard, enjoy my life! Tuscan steak from Chianina (cow breed) is served al sangue (very rare) with white beans and roasted potato sides. The thick beef pieces, grilled on open fire, are nicely roasted on the outside while retaining soft fleshy interior. Other sides include salads with bell peppers and lemon wedges. Wild boar is found on most menus in Tuscan towns. You’ll find tenderized meat in stews like cinghiale in umido, roasted meat versions or pasta sauce. These are served with antipasto, panini or pappardelle, and usually accompanied by tartufo sauce and tomatoes. One of the few desserts in Tuscany, cantucci are crunchy and small almond-flavour cookies served with vin santo (desert wine). The double baked biscotti is dipped into the wine to soften it a little. Some enjoy these cookies with caffè ristretto (short expresso shot). A cold salad made with bread soaked in balsamic vinegar. Wet bread slices are added to red onions, tomatoes, basil and topped with olive oil. Farmer versions of this summer salad contain sun-dried tomatoes, onions and cucumbers with olive oil and vinegar. Richer version of this salad contains capers and tuna. A popular street food, Schiacciata is essentially a flatbread served stuffed or plain with olive oil and salt. The flatbread is either baked soft with fillings or crunchy. Stuffing includes cold or cured meats, cheeses and vegetables. Schiacciata alla fiorentina is a lemon scented sponge cake covered in vanilla and sugar. A street food from Livorno, this savoury cake has chickpea flour as main ingredient. The thin cake has a soft inside with crunchy outside and comes with a generous sprinkling of black pepper powder. Cecina is also served sandwiched inside baguette or focaccia bread, with grilled aubergines as sides. Would you like to learn about Italian cuisine, meet the real Italian chef or simply try local specialities? Take a look at the latest cooking classes, food tours and wine tours in Italy!